Why You Don't Need To Worry About Calories On Thanksgiving + CONTEST! I was watching the news this morning and they ran a segment about how the average American will eat between 2,000 and 3,000 extra calories on Thanksgiving. Big eye roll. This kind of “scare tactic” is enough to make most people anxious about gaining weight. 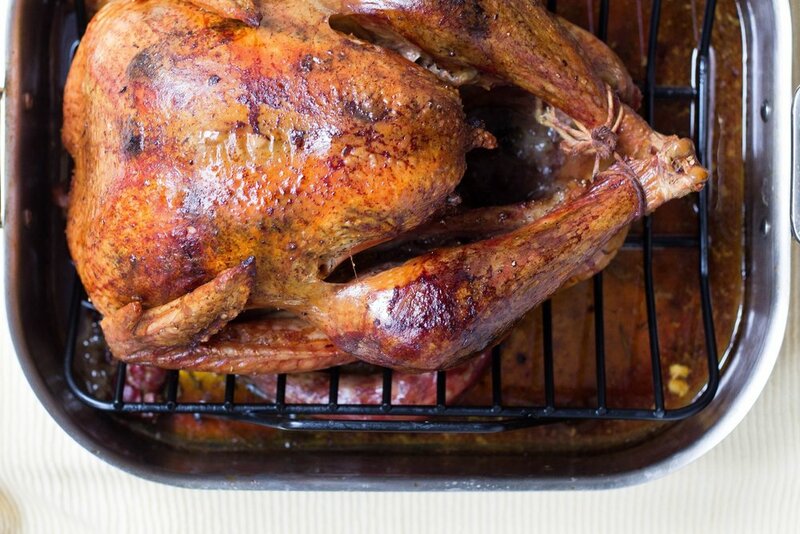 But here’s why you don’t need to worry about calories on Thanksgiving. I hate math but let’s crunch some numbers. According to mainstream science it takes roughly 3,500 calories to gain a pound of fat. Let’s say you are a 40-year-old moderately active woman who weighs about 150 pounds. You probably burn between 1800 and 2000 calories every day. If you are sedentary, maybe less, if you work out, maybe more. Let’s say on Thanksgiving you eat your normal breakfast and lunch. For ease, let’s say you consume 500 calories for breakfast and 500 for lunch. That’s 1,000 calories of your total energy requirement. Now let’s say you go and eat a generous 2,500 calories at the Thanksgiving meal. That means you’ve eaten a total of 3,500 calories for the day. Now subtract your daily calorie burn from that number (let’s be conservative and say you burned 1800 calories). You’ve only overeaten by 1700 calories. That means – if you gained any fat at all – it’s less than half a pound. Takeaway message: People often vastly overestimate “the damage” from a heavy meal. Yes, overeating all the time will cause weight gain…but a single meal will not, so stop worrying so much about it! If you’re dumb enough to get on the scale the day after Thanksgiving (please don’t), your weight will most certainly be up at least three pounds…and could be as much as 10 pounds higher! Thanksgiving is usually a carb-loaded meal. There’s mashed potatoes, sweet potatoes, bread, stuffing, pies, cookies…you get the picture. Look at the word carbohydrate. Notice the second part of the word is hydrate. Carbs are “water-loving”. When you eat a massive amount of carbs – more than what your body is normally accustomed – your cells hold extra water. Let’s not forget all the salt in the Thanksgiving meal! Salt also makes your body retain fluids. Ugh…more math. Water is pretty heavy stuff. A gallon of it weighs roughly 8 pounds. It’s easy to see how your weight could fluctuate by up to 10 pounds if every one of your 37.2 trillion cells are retaining water after a large meal. Takeaway message: Be smart and don’t weigh yourself the few days after Thanksgiving…or ever again for that matter…because scale weight is not a good indicator of what’s actually happening inside your body. Have you ever had the “meat sweats”? If you have, you know what I’m talking about! You eat a large meal and then several hours later you’re so warm that you’re sweating. Believe it or not, your body weight is controlled by your brain. And your brain likes to maintain the status quo and has many “fail safes” designed to keep your body right where it is. This is called “set point weight”. Back to “meat sweats”…when you occasionally overeat your body will try to eliminate the excess calories you consumed by bumping metabolism to burn them off or compensate in others ways. Generating heat is one of those ways. Your body also circulates more anti-hunger hormones like leptin, which is the hormone that says “I’m full”. If you are an intuitive eater, you may find that you are less hungry for several days after a large meal, and will simply tend to eat less. Occasional overeating is key here. If you are overeating often or eating a lot of processed junk and restaurant food, you will increase your body’s “set point weight” and will most certainly become heavier. Takeaway message: Calorie intake often balances out over several days. Your body is fighting to maintain your current weight and has sophisticated methods of ridding itself of excess calories from an occasional bout of overeating. Bottom Line: Don’t Worry About Calories on Thanksgiving! Don’t worry about how many calories you consume today because an occasional bout of overeating will cause little, if any, weight gain. Go to Thanksgiving dinner, enjoy the foods you love with gusto, visit with friends and family, and stay off the scale on Black Friday (is that why it’s called Black Friday?!?). If you found this post helpful, you may also like the tips in this one: How Do I Avoid Holiday Weight Gain? EXCITING NEWS!!! I’m doing a special giveaway right now! You can enter to win a spot in my next Intuitive Eating Online Course that starts on December 1st! If you win the spot you will also get to choose one lady friend to enter with you! 1. Like my business page on Facebook by clicking here and then clicking the “Like” button. 3. Take the Intuitive Eating Quiz by clicking here. I will randomly choose a winner from my email list, so to be eligible to win the contest you must add your email when prompted by the quiz! I promise I will not inundate your mailbox with daily emails and program advertisements, nor will I ever share your email with third parties! Women only please – sorry guys! I’m working on something for you too - coming in the New Year! One winner will be chosen on November 28th, 2018. In order to win you must complete all three steps! Love Leftovers - Take The Five Day Challenge!